The great easy-to-use online video downloader will help you auto-detect and download streaming videos from Internet and then help you convert the downloaded files to other formats that you need. Veoh is one of the most popular video-sharing webisties. Just like YouTube, Dailymotion, Metacafe, Veoh also offers millions of online videos like movies, music, TV shows and allow users to upload their user-generated videos. But how to save those wonderful videos on your iPad or other portable devices for easily playback offline? You need a Veoh Downloader to help you. 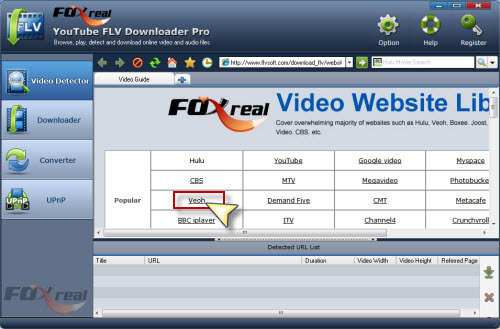 Foxreal YouTube FLV Downloader Pro is just the best choice for you. With which you can easily download/convert Veoh videos to your iPad, iPhone 4, iPod Touch, BlackBerry PlayBook, BlachBerry Torch 9800, Galaxy Tab, Galaxy S, etc. without any quality loss. To start, please free download Veoh Video Downloader here. Install and run it. Directly click Veoh in Foxreal Video Webisite Library to open and play Veoh videos. When you are playing the online videos on Veoh, the program will auto-detect the URLs of those streaming flash videos. Choose the flash video you want to download, click the green start button to create new download task. Before downloading/converting, please set output parameter for iPad in New Download window. 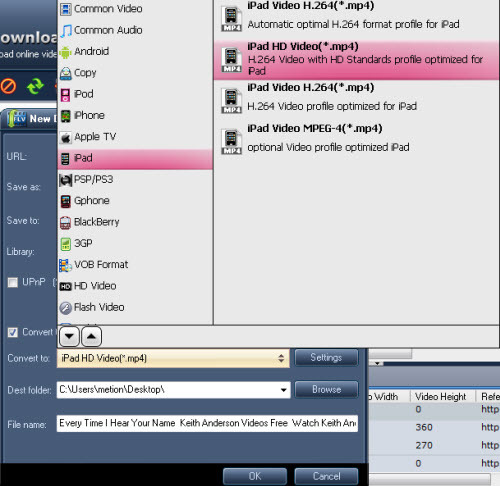 Enable “Convert to video” and choose output format for iPad like iPad Video H.264(*.mp4), iPad HD Video(*.mp4) etc. Also you can click “Settings” to optimize parameters like codec, size, bitrate, framerate. After you finished all the settings, click “OK” to start downloading/conversion task. The best Veoh Video Downloader/Converter will process up to 5 tasks at the same time. Once the conversion task is completed, you can find your converted Veoh files in the destination folder that you set. Then transfer them to your iPad and start to enjoy. Free download YouTube FLV video, Free download online video, Download Google video, Download Metacafe video, Save Flash video on PC, Enjoy FLV on iPod Touch, Free download NBA highlights, Download Halloween Prank Video from Internet, Download MTV Video.